You know how you think you've got an eBay auction licked towards the end? Only for some cockarse to outbid you within the last 10 seconds? Well, that happened to me today. With this. Goodbye decent PC magazine collection. Scammed out of £250 once. Listing seemed authentic, buyer had excellent feedback, photos looked genuine. Turned out to be an account hijack. Had I checked the guy's history and other items, I'd have seen that he'd previously only sold cheap children's toys and was now suddenly selling wave upon wave of high-end TVs, home cinema equipment and audio stuff (I'd bought an iPod). Never did get the money back. are those sniping programs still allowed? Yes. Doesn't everyone use them? I used to use a sniper site in the past, but I long forgot my account details, not to mention the name of the site itself. And I just felt like I couldn't be arsed to pay for the privilege again. I wouldn't be arsed using ebay directly any more. With the snipey thing, you just put in the real maximum you'd be happy to pay, safe in the knowledge that it's not going to reveal this until the last seconds. If you don't win, too bad, think no more of it, as it was fair and square - at least you weren't outbid by someone manually entering a single bid increment over yours. Come to think of it, that was the very site! As for the paying thing, I think I chose to subscribe to some enhanced plan or other so I didn't have to worry about being denied another sniping opportunity for some silly reason. http://fatfingers.com/ searches eBay for common spelling mistakes. My mate got his Discovery for £300 (Book price ~ £1,200) because it was a "Land Rovre tow horses". I bought an ancient Apple Newton off of eBay once, simply because I'd never seen one before and wanted to know what it was like. I'd already decided I was willing to pay no more than 15 quid for it, since I really was just after some retro-techy tat rather than a useful device. Unfortunately I was, at that time, working in the payroll department of a very large temping agency, and had gotten very used to entering financial amounts into a computer without using a decimal point. Hence me entering my maximum bid as £1500. Cue 10 minutes of sheer panic praying no-one else would come into the auction and bid some crazy sum for it. (Fortunately no one did and I ended up paying about £14.50 for it). Had the Prince of Nigeria snipe my Nokia 6230i auction, had to relist it and got about £15 less. Bought a Powermac G4 and it had no OS installed, had to send it back and wait for another to be sent out. And now that's knackered itself too. There's quite a few banned Xbox 360s up for auction at the moment. Buyer beware and all that. Although for a lot of them they are saying you cant use it with Xbox live , and if you wanted a 2nd console for something else (or just playing offline) then they are going to be cheaper than a non banned one. Could be good for parts too, if they're really cheap. That move must have boosted 360 sales a fair bit, wasn't it supposed to be about a million that they banned? I often scour the Console Buy-it-Nows looking for good stuff and have to wade through lots of banned and RROD machine listings. Auction Alert - Runs in the background and pops up with alerts of new items matching your search criteria, so good for new BIN listings. It can also send emails if I remember rightly so you could have it running on another machine as I think it can be a little sluggish when checking for multiple searches. Free too. Auction Sentry. Not free, but my sniping tool of choice. Been scammed a couple of times on Ebay. Nothing too extortionate, but I'm extra wary of anything that looks too good to be true now. The poor rich mans Amstrad Penpad. Actually Amstrad deserve some credit. IIRC the Penpad came out before the Newton. The problem was that given SurAluns price consciousness it was based around a Z80 derivative and therefore not very powerful. Ergo it wasn't very good at handwriting recognition or much else. The Newton was good but far more expensive than the Penpad. IIRC the Penpad came out before the Newton. Nope. 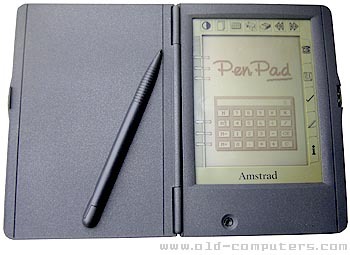 According to Wikipedia, the PenPad development started in 1993, same year the first Newton MessagePad hit the market. The Newton OS development had started in 1989. That's the development though. When did they reach the shops? IIRC The Penpad came out in 1993. Apple had the Newton in development for a number of years but I have a feeling they may have launched in the UK after the Penpad was out. Either way the Newton was beyond the reach of most people in terms of cost. Incredibly, someone may have actually bested Alan Sugar at something. Just confirmed by looking at a few websites, the Penpad was released literally weeks before the Newton. Of course if you thought the Newtons handwriting recognition didn't work then you should try the Penpad! I personally think it'd be hilarious if Apple revived the Newton brand for the rumoured tablet computer device. Yeah, so, eBay. Fortunately only got scammed back in the earlier part of the decade, when I bought a copy of Gradius Advance that turned out to be fake. But then as I discovered via a forum full of knowledgeable nerds, 99% of GBA games on eBay were fake, and that's almost certainly still the case, it's safe to bet. I have never been scammed, thankfully. As a buyer, I only ever buy cheap, BIN items, with a few exceptions now and again. As a seller, I'm a right nazi about what I will and won't accept. I haven't had much trouble with Ebay, but I'm still pretty pissed off they force you to give a free P&P option for games, filling the act of selling them with all sorts of hatred. Free Recorded: safe in the knowledge you can see whether or not it has been delivered, but eating away at your profits. Free non-recorded: entirely at the mercy of the buyer as to whether or not they scam you out of your game and money, slightly more profit. Stupidly, I sold a game recently and provided my free option as 2nd Class Standard, giving the option of 1st Class Recorded at an additional charge. Of course, nobody wants to pay a quid for postage, so the buyer opted for the free one. Two weeks down the line after receiving no feedback, I contacted the buyer. He claimed it hadn't been delivered yet. Fortunately he sounded like a reasonable guy, mentioning the Royal Mail troubles and the rules about postage, so I remained optimistic. Now, fortunately when the package did eventually turn up, the guy left feedback and sent me a message. The box had been battered in the post, despite me packaging it up very well, and had taken over two weeks to arrive. Dicks. I'm very hesitant to use Ebay at the best of times. I don't think I'll bother trying to sell on there again. The day eBay collapses and there is a decent competitor that works, i'll be very happy indeed. So, auction sniping tools, eh? Just looking at the options, the Lady has her eye on something on ebay. From my earlier post, Auction Sentry is good. It has a 10-day free trial too so you could just use it for what she's after and then uninstall. Auctionstealer.co.uk has never failed me. Free, too. What's wrong with putting in an early max bid of what you're prepared to pay? You bid, someone sees it, they outbid you, you automatically rebid, you pay more. Bidding right at the end avoids that. "I think Object X is worth £45, tops. The current bidding is £2, so I'll let it bid up for me." Any other way is silly. This is exactly the same thing but by bidding at the last minute it pushes it into a smaller time frame. Unless you're banking on the other person being stupid enough to put in their last second bid as only one step above the current bid. Nah. I want my maximum bid to be a secret. With ebay, it isn't - the setup leads to people getting carried away and competitively bidding until your maximum is reached, and the item sells for higher than its worth. In a real life auction that's fair enough but on the internet it's idiotic. I use auctionstealer to get some protection from that idiocy. It works, too. If you put your bid in in the last 10 seconds there is no time for anyone else to raise theirs. The system sorts it out. If someone else bid higher, that's what it goes for - all perfectly reasonable. Ebay sniping works because Ebay isn't an auction. It's a fixed time limit price war. A real auction doesn't have a fixed deadline, it keeps going till the bids run out, so sniping wouldn't work. All ebay have to do is give the auction lister the option of allowing the auction to extend for 5 minutes if there has been a bid in the final 5 minutes, and remove the ability for bidders to bid cancel. ps. I use Gixen to snipe. Then you lose the advantage of bidding on stuff that finishes between 5pm and 6pm and in the early hours. Sure, that process reduces some of the fun you can have as a buyer, but it makes selling a much nicer prospect. Good lord, what money they must make. Fees for listing, fees against the final selling price, and then PayPal fees on top of that. My last batch of selling landed me an £82 bill. I use Gixen.com, it's free and has never failed me yet. Before I sniped I was paying more on average for the same things. To be honest I can't see the logic in not sniping. The wife is currently selling all of our possessions on eBay. She's doing well at the moment, selling a sleeping bag thing for about 70 quid and a dress she has never worn is going for over 40. Huzzah! We might be able to afford that baby after all! I'm just about to sell a load of stuff on there for the first time. I've got some comics, trading cards and a load of vinyl records to sell. Anyone have any top tips for n00b ebay sellers. I didn't think you could buy babies off eBay? Anyone have any top tips for n00b ebay sellers. I list everything at a 99p start price with no reserve. Make sure you use actual photos of your own stuff, not stock photos. Ignore the chancers you get at the start of every auction, asking if you have a buy it now price, I always say no but let them make an offer. Their offer is always ludicrously low. Write [email protected]@k in the title & tell folk how much of a bargain the thing is without actually describing it. Check out what they're worth first. You can view completed listings on ebay to see what similar stuff has sold for. If something's worth less than a fiver, it probably isn't worth putting it on. Arrange it so your auctions end after 6 or 7pm when there's more chance of potential bidders being able to bid. You can set the auction start time at a cost of a few pence. Some people may be put off if you've got low feedback. I know I'll never buy anything off anybody with zero feedback again after getting done over numerous time. So: If I don't snipe I'm bad at ebay? This is what my GF thinks. Personally, I'm not willing to pay anything more than £3.45 for item x, so why don't I just put that in at the start? If other people want to pay over the odds, let them..
ps: What do Auctionstealer.co.uk get out of it? Why do they do this? What does AuctionStealer UK do with personal information? AuctionStealer UK will never distribute any of the information gathered to any third party for any reason. From time to time you may receive general site updates and notices about individual auction items that you have entered into the site. At any time you may remove yourself by logging in and modifying your profile. What's in it for them? I don't trust them with my details. I've never bothered with sniping on eBay either. MarkG, as MrBurrrt says look to see what items are going for. I always start mine off as low as I'm willing to take really and overestimate the p&p so I'm never done over on it.